Planning is always a good use of any extra time you may have. And since this is a Leap Year, you have one whole extra day for planning purposes. Planning is an ongoing process. With the extra day in the year, it might be time to reevaluate your plan. If a certain aspect of a plan is not working or needs some adjustment, change it. Even junking a strategic plan is acceptable when circumstances and assumptions warrant. However, a replacement strategy should be developed in its stead, not just a series of jumps from here to there. Another important part of business planning is the creation of a succession plan. Failure to plan for how clients will be taken care of as a lawyer approaches retirement age can, according to some authorities, be construed as a reckless disregard for client welfare—a true ethical violation regardless of the size of the firm. In large firms, planning and structuring client service teams is perhaps the most effective way to begin the transitioning of client service responsibilities. In small firms and solo practices, planning options can include simply closing or selling the practice, grooming a successor by hiring an associate to learn the practice, or merging with or hiring a lateral with the option to sell the practice to him. No discussion of goals would be complete without touching on work-life balance goals. Lawyers are always concerned about having enough client demand in the pipeline, but being overextended is just as great a worry. All successful people work long hours and are focused and passionate about what they do. In the effort to excel, made more intense by the pressure of economics, trying too hard can cause problems for lawyers. However, successful lawyers can get past the distractions and stress, define what matters, and then put their focus on what they value most. Take the extra day this year to consider your work-life balance goals. 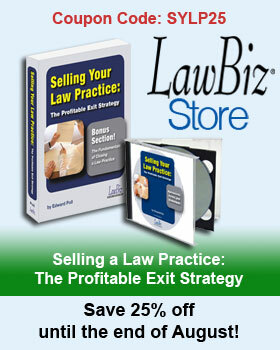 Do you need help making your next big plan for managing your law firm? Call or e-mail to schedule an appointment today.